This summer has been remarkable in so many ways. Accompanying me on my trip to Kenya this year were many sponsors from the program; Emily, Michelle, Jordan, Bilaal, Nick, Jack and April. In each case they had the chance to meet with their sponsored child, meet the extended family and in most cases travel to the homestead where the child either lives or lived before coming into either Exodus or Rolling Hills Residence. 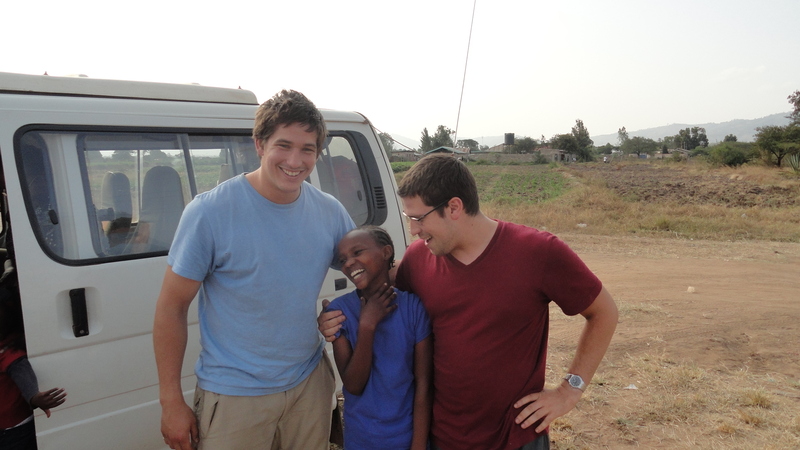 Nick, Jack and Anne – capturing the moment when she found out they were sponsoring her! There are now 97 sponsored children. Of these 29 reside at Rolling Hills Residence, 5 at Exodus (along with other children in Elijah’s children’s residence), and 63 in the homes of extended family members – usually grandparents. Yet, that’s just the start of the story and only a small number of the children being cared for – let me explain. 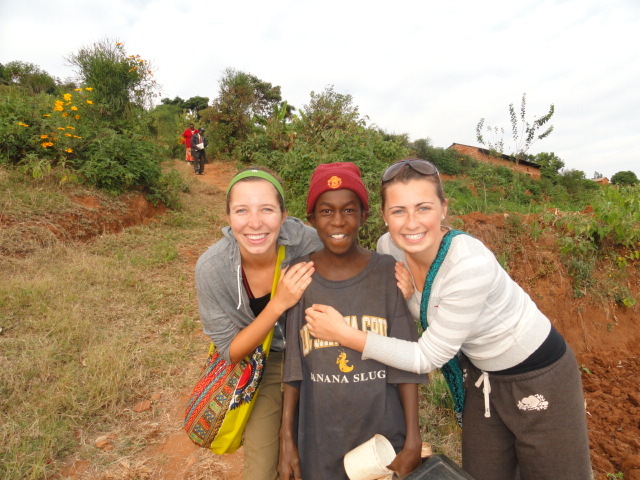 Benjamin is sponsored by Zoe, Michelle and Paul. He comes every month for the food distribution and brings that food package back to his extended family. In his family, along with his grandmother are five other children – two are his siblings and three are cousins. The food he brings is shared with his entire family. 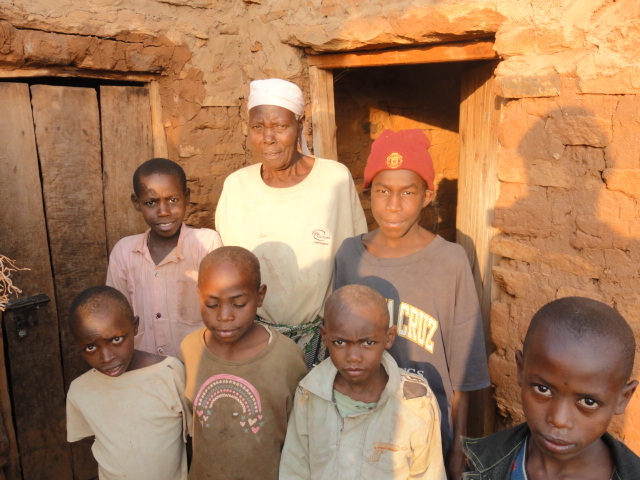 Each of these five children has been given a goat, blanket, mattress, school uniform and their school fees are paid. The family has also been given cooking pots and tools to work their land. 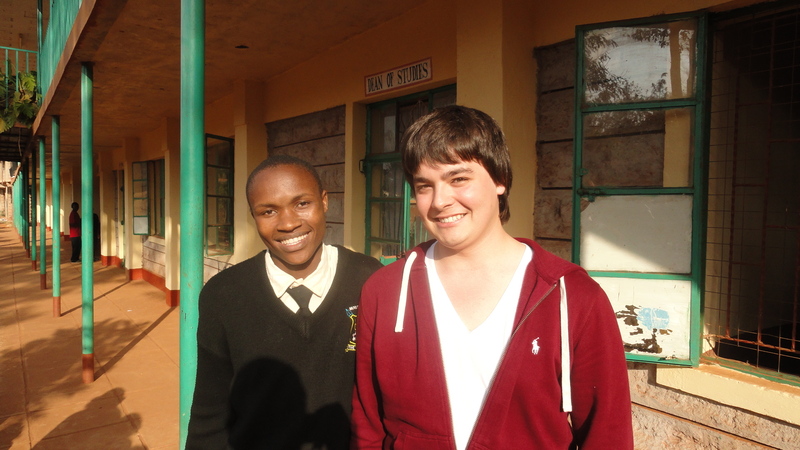 We have also committed to Benjamin that we will fund his high school education next year. While only one child is sponsored, this sponsorship has resulted in five children and their grandmother having a substantially better life. Ruth and Kay examined each child in the program to see the impact their sponsorship is having on other children – other orphans – at their homestead. They were able to identify over 400 orphans who are now being provided services by the program. Food distribution remains a major monthly activity. 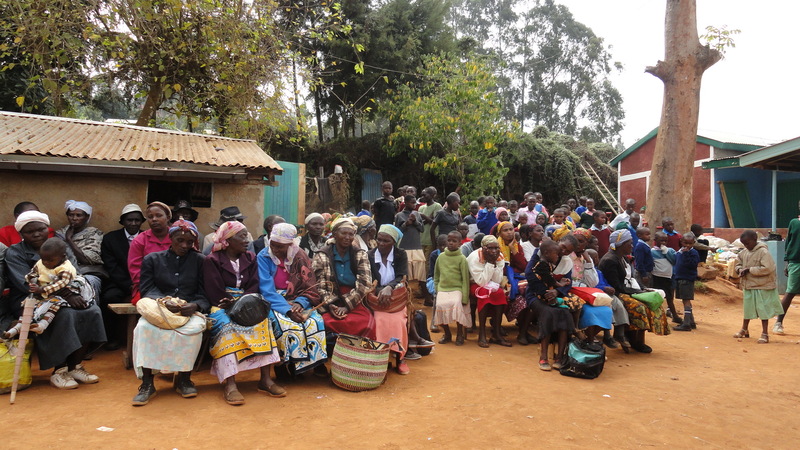 Upwards of 200 people attend – the sponsored children accompanied by siblings, grandparents or guardians. The food distribution days are a wonder to behold. The first people start to arrive at Rolling Hills as early as 9:00 in the morning. Transportation has been arranged for those who are travelling far or are old or very young or infirm and they arrive on a ‘matatu’ a bus with 70 seats and 140 or so people. These days are a shared celebration in which children in the residence visit with extended family members, speeches are given and everybody shares in a meal. Imagine hosting a meal for that many people! 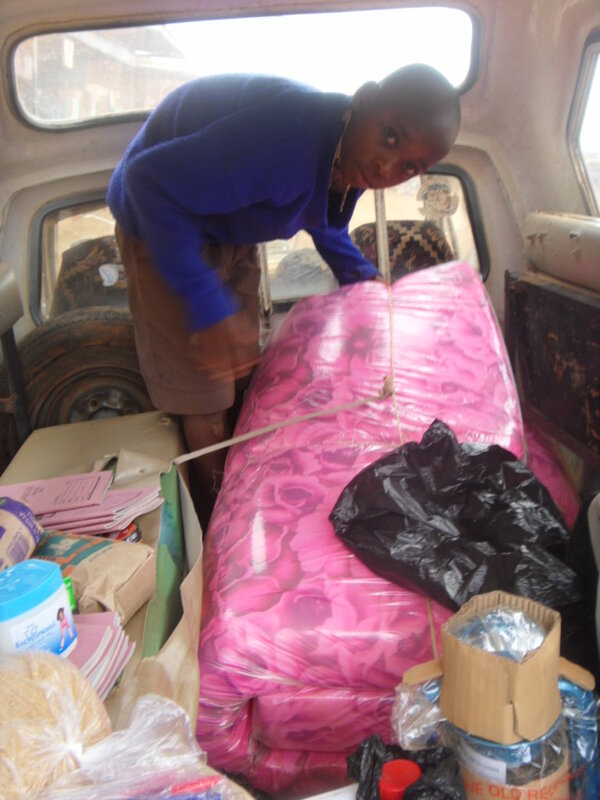 Along with the food they are also given items from wish lists that were granted, beds, uniforms, school supplies, lamps, mattresses, tools and goats – all of which go back on the top of the matatu! 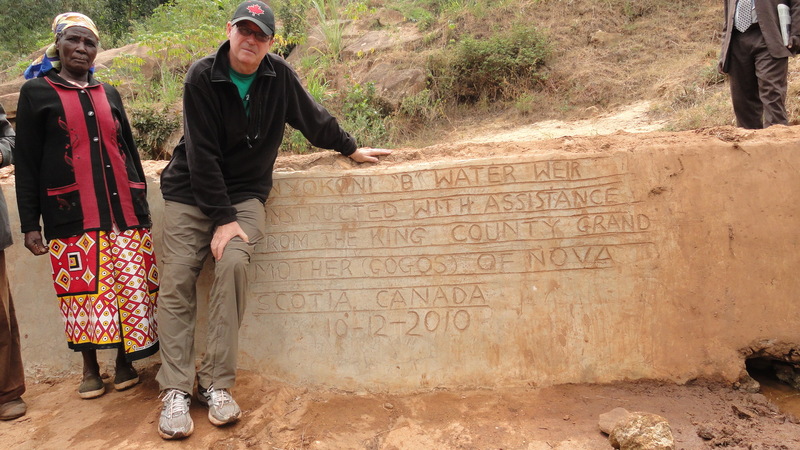 You have all probably heard a great deal in the news about the drought in Eastern Africa. While this is centered more in Somalia, Ethiopia and north-east Kenya it has had a significant impact on all of Kenya including our project. There is always a ripple effect. A simple example is the cost of maize flour. One year ago we could purchase 1 kg for 35 Kenyan Shillings. The cost now for 1 kg is 80 Kenyan Shillings. There has been a change in the exchange rate – a Canadian dollar is now worth more Kenyan Shillings – but this had not come close to compensating for the increase. We have made a commitment to you and to the sponsored child and their family to keep the food distribution quantities the same. 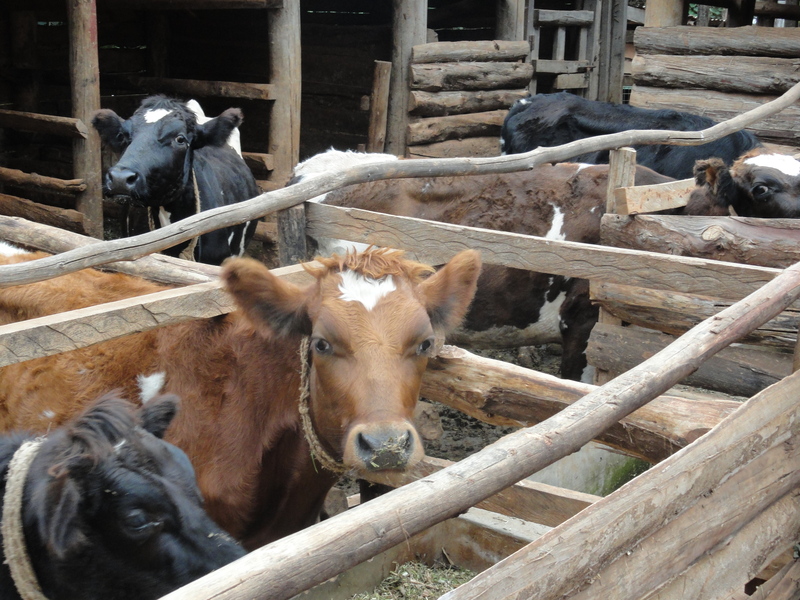 At a time when they are able to grow less of their own food they are even more dependent upon the food distribution. To do this we have diverted money from other sources that would have normally gone for the completion of the building or for water projects in the community. It strikes me as a particularly painful irony that the lack of water to grow food has resulted in us having to suspend projects that would have provided water to grow food. We will, hopefully, get back on track with these projects – delayed but not abandoned. 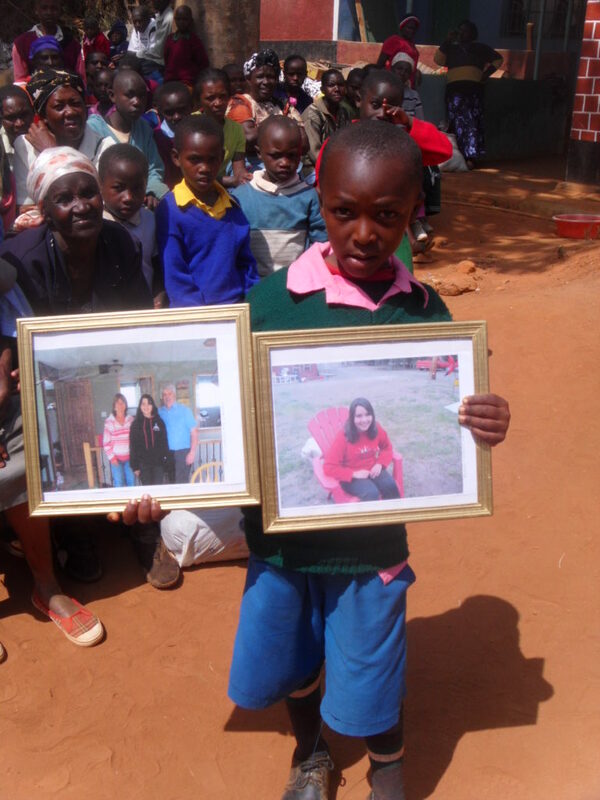 William Dunbar students granted two wish lists for Michael Mbaluka and Angeline Mutie. Angeline – One of the wish lists granted by funds raised by William Dunbar P.S. Tools provided because of Amanda and Stephany. In addition these two wonderful young ladies paid for school fees for three children! Below is a letter from Kay explaining how the donation from Rhonda and Tim was given out at a food distribution. I trust you have been keeping well? 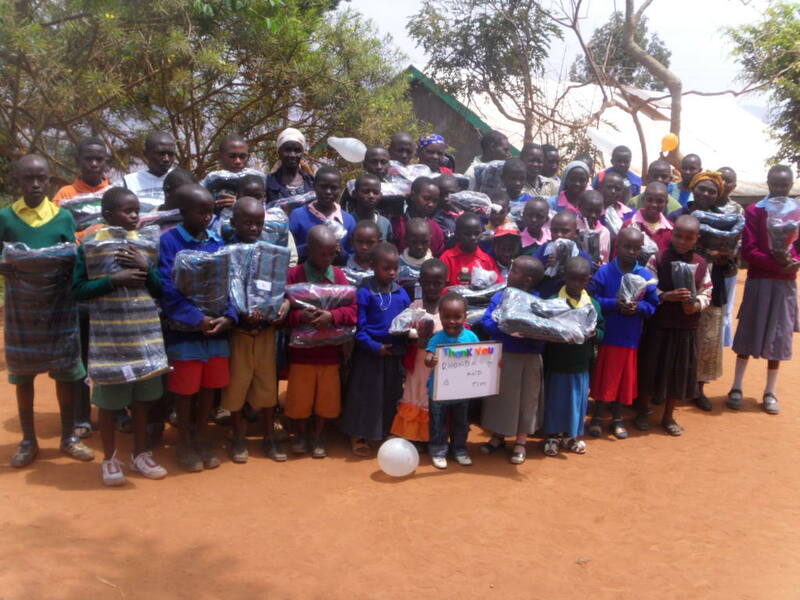 I have attached a group picture of the 23 kids who got blankets and the 29 girls who got shoes! This was taken yesterday during our monthly food distribution and the recipients could not believe the generosity of someone to buy so much for them all at once! So out of wanting to help one boy with a bicycle, came a blessing to 52 kids! Thank you for your generosity towards them. 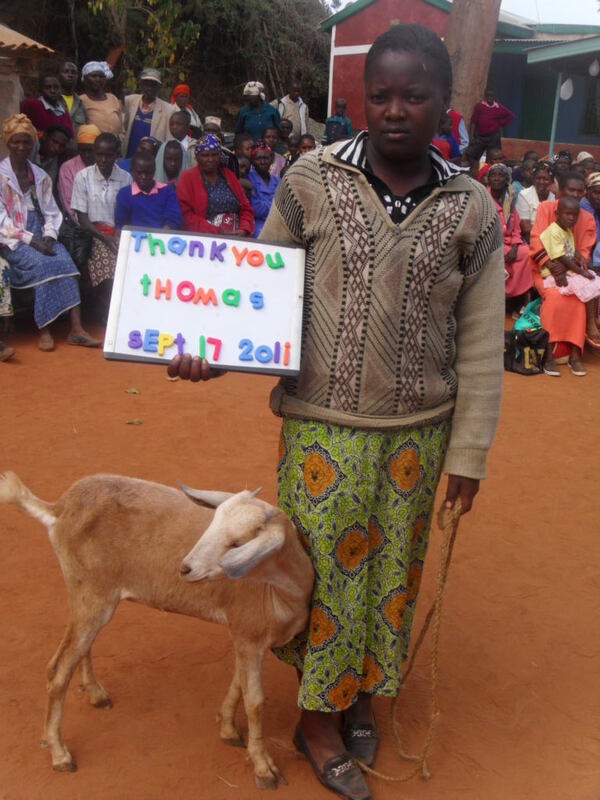 While more than a dozen goats have been given out over the past months (and pictures sent to each of the sponsors) I wanted to note one presentation. One of our most faithful supporters is Barb Kettle. 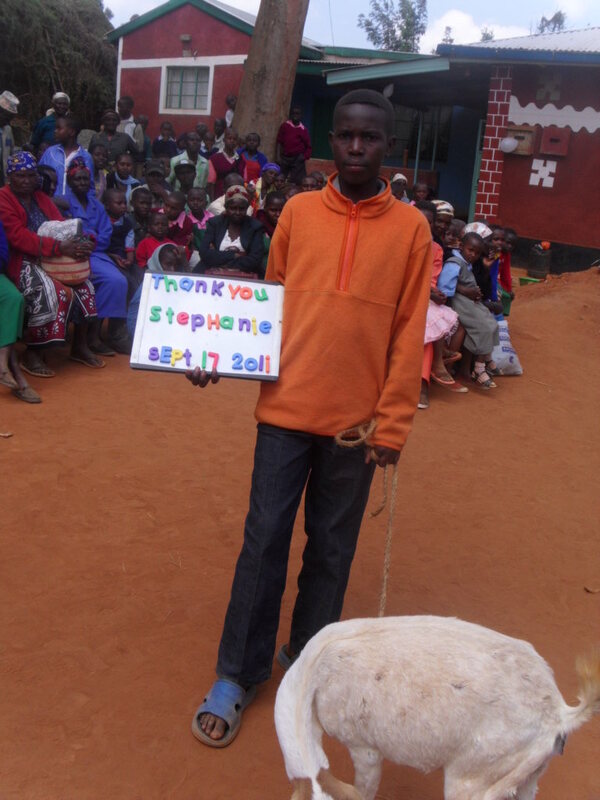 She requested that two goats be given out as a wedding present for Stephanie and Thomas. Weddings are particularly ‘close’ to my heart as I walked my daughter Christina down the aisle on August 13th. I wanted to note that she and her husband (I’ve never written that before!) made a generous donation to Creation of Hope as part of their wedding celebrations. 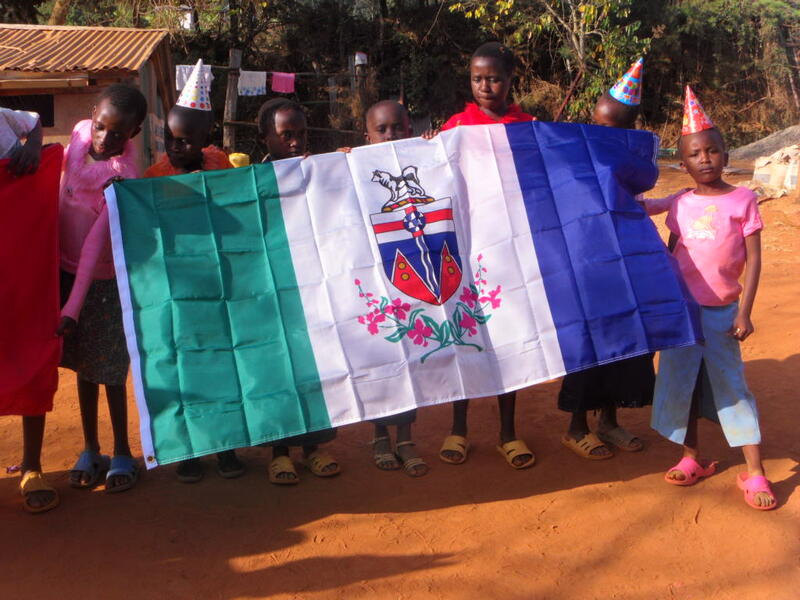 Many of the children in our program do not have official birthdates. In some cases it is not only an unknown specific day but the month or even the year. We decided that they all deserved both a birthday and a celebration to mark that wonderful occasion. 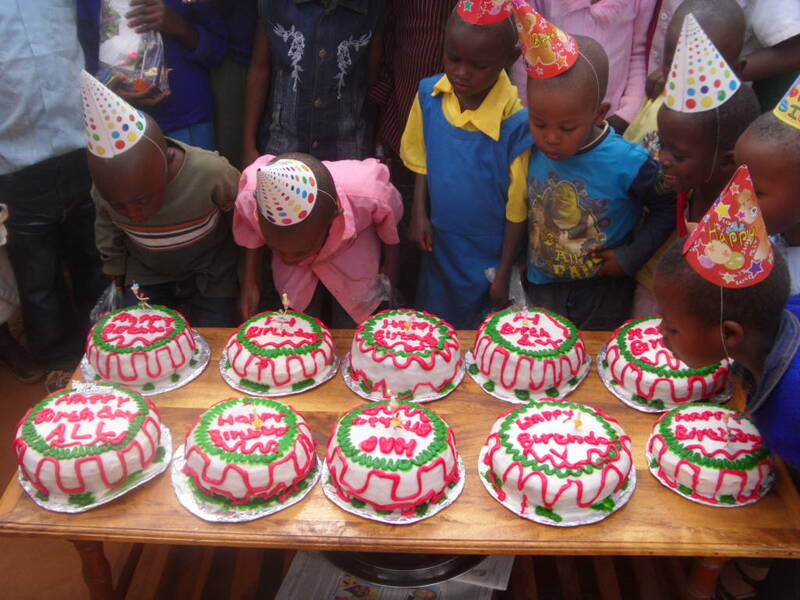 On the last food distribution day we held a birthday party for 97 children! 10 birthday cakes, 20 kilos of pilau rice (thanks to mom! ),10 kilos of beef, 97 fudge chocolate bars, 97 mint chocolate bars, 50 balloons (and I think I should have invested in an inflator:), 9 1/2 crates of soda, 97 lollipops, 97 suckers, 97 packets of eclairs, 97 packets of biscuits and 97 birthday hats later PLUS the normal food package, everyone was pleasantly full and VERY happy!!!! The day started at 10am and ended at 5pm and no one complained (except for dad because candy wrappers were left all over our compound:). We estimated that including the 97 kids, there were about 160 people in attendance! Thank your students, first of all for their patience as we waited for the opportune time to hold the birthday and secondly, for thinking to do this for the kids. They had so much fun! I could see the excitement on their faces as they eagerly opened up the treat packs to see what they held! As for the cake, we hired a neighbour to bake them for us (which ended up being way much cheaper than had we bought them from a bakery) and everyone agreed that she did a great job! 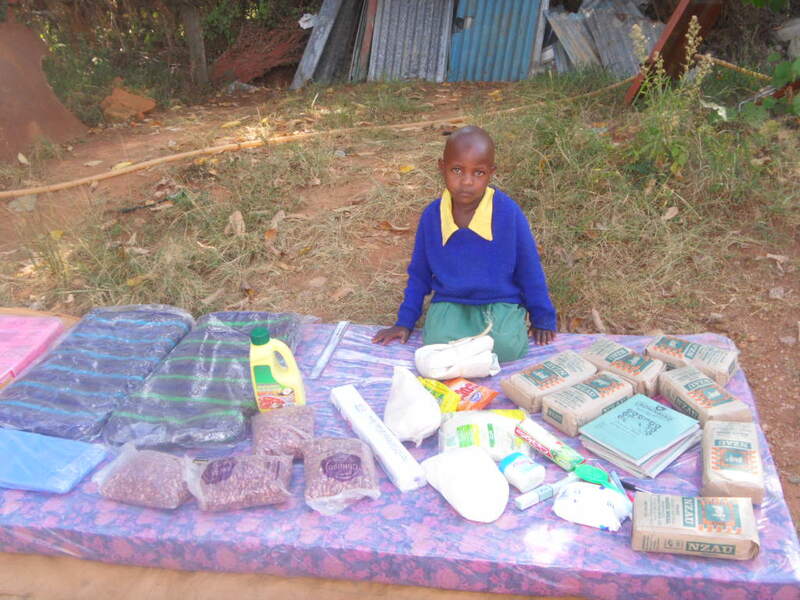 Everything was bought locally apart from one or two items which were bought in the neighbouring town of Machakos. I know the pictures did not capture the mood well but it’s the best we could do! I hope your kids feel satisfied with what their donation has done! 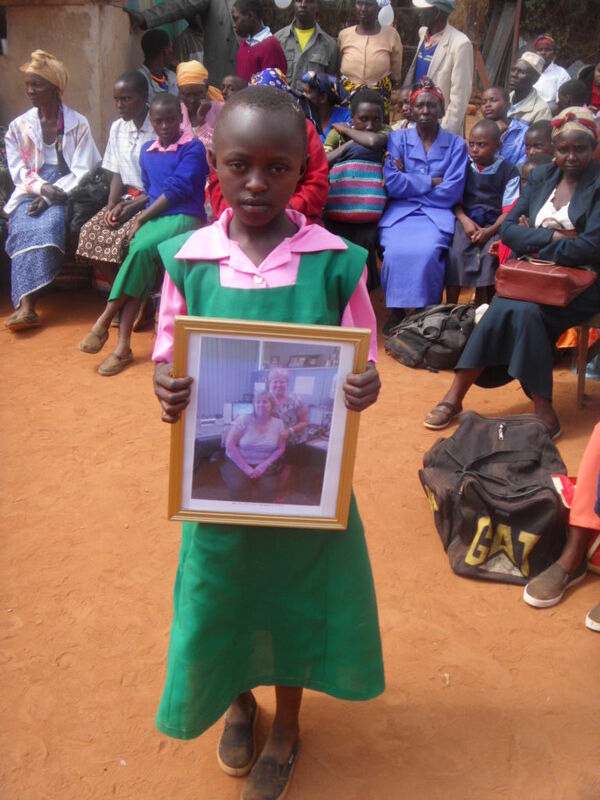 The food distribution days are also when we welcome our newly sponsored children and present them with a picture of their sponsor. We have added a number of sponsors this summer. 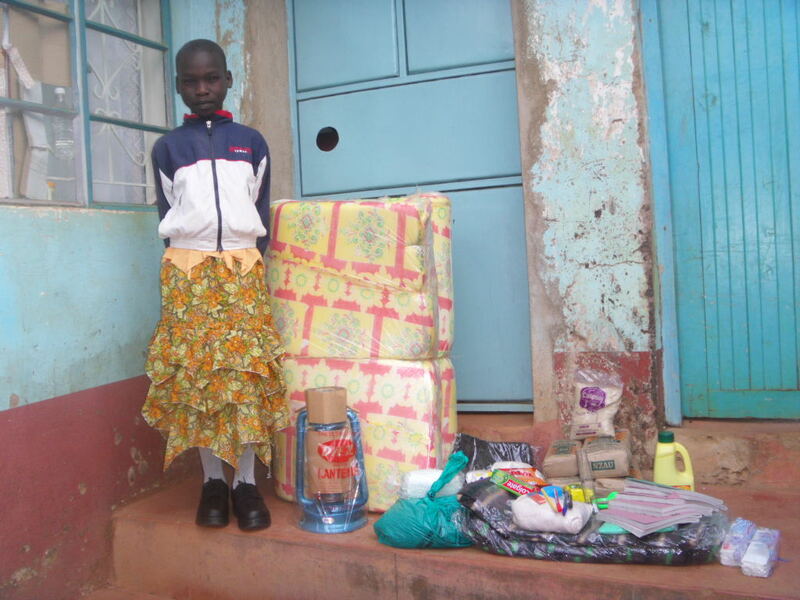 Teresa and Ken Toten have sponsored Theresia Mueni Wanza and also granted her wishlist. 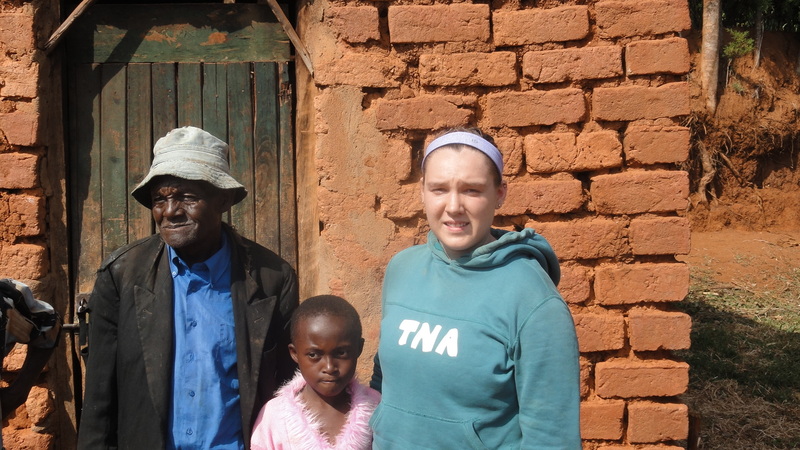 Emily Ross has now sponsored Mwongeli Nzula and also granted Mwende Mueni’s wishlist. Our new building continues to rise up. 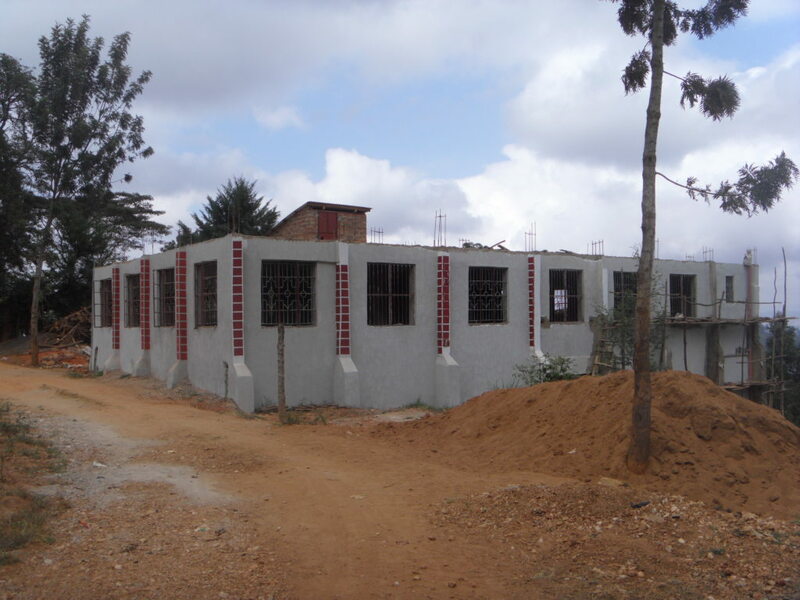 It will not only be the new residence for our children but will house the offices for our outreach program and the dining hall will be used as a conference centre and the rental of this will help to fund the ongoing expenses of the children’s residence. The process has been slowed by a number of factors – most of them related to costs. We have had to make a number of changes to comply with requests by the Kenyan government. As well we have had to divert funds from construction to support food distribution as costs have risen dramatically. 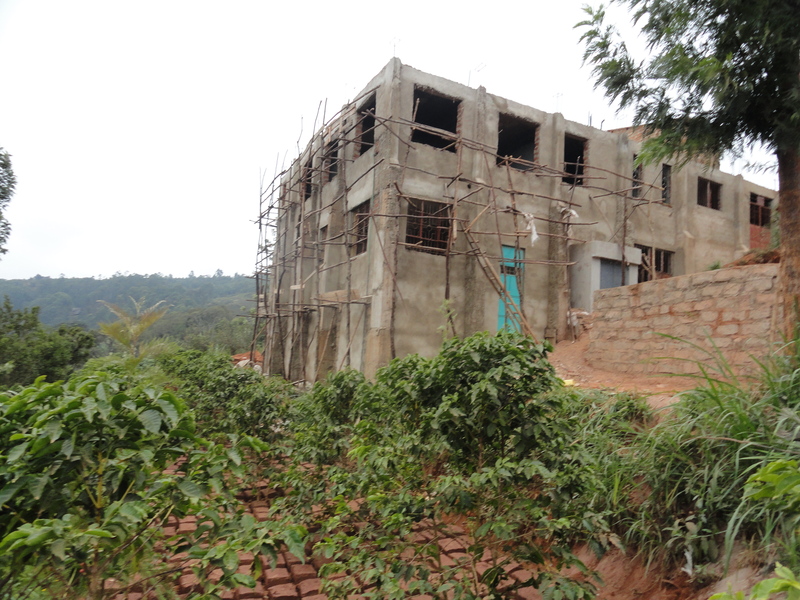 The first three floors are almost completed and the boys have already moved into the new residence and the dining/study hall will shortly be in full operation. 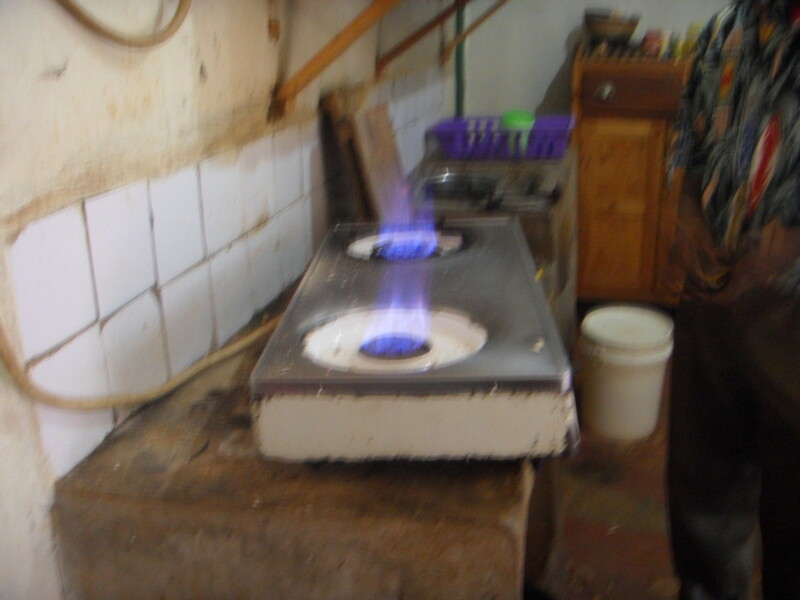 All of our cooking needs at the new residence will be supplied by a biogas plant. 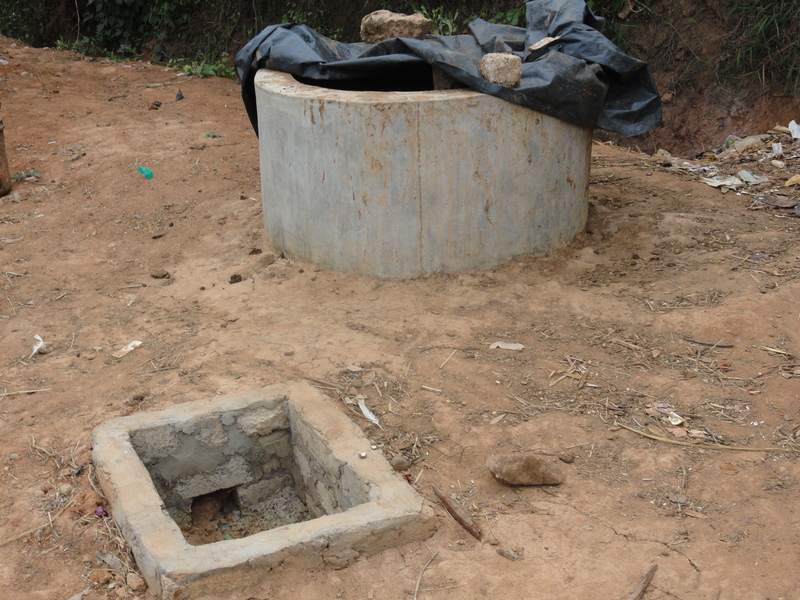 Below are the three pictures that show the journey from source to fuel. Our library has been open for business over the past six months. 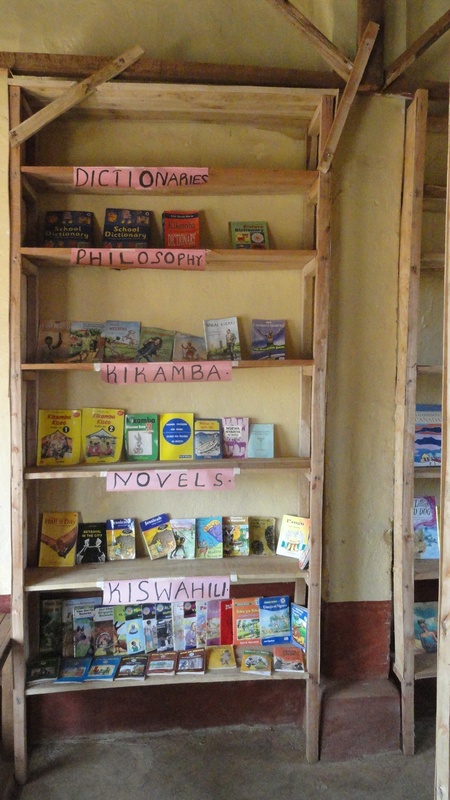 Our librarian received special training – provided by the Kenyan government – and now the library is in constant use by both students from the school – where it is attached – and local community members. This is part of the overall commitment to helping our children – and all the students of Kyangoma – where many of our children attend. Recently Kyangoma Primary – where a large number of our students attend – made a dramatic leap to become 4th highest scoring in the entire district. We feel that our program has had a significant impact on this jump by providing school supplies for all the children and teachers, extra outside teachers, school uniforms, and of course the library. We have continued a tutoring system for all of our children in the residence. 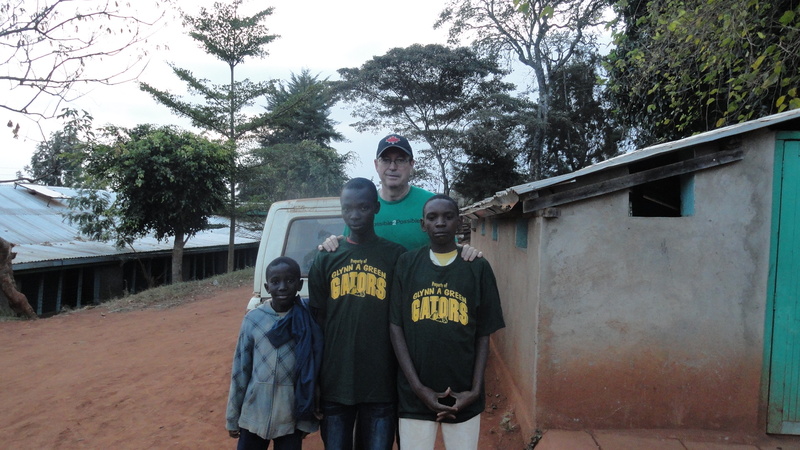 Each day after school they receive an additional 1 to 2 hours of instruction and education. In addition we have made sure that almost without exception all children in the program have been given additional school supplies, uniforms, and text books that have made them better able to realize their true potential as students. The results of all of this are both dramatic and quantifiable. Our children – your children – have made remarkable jumps in their academic scores. 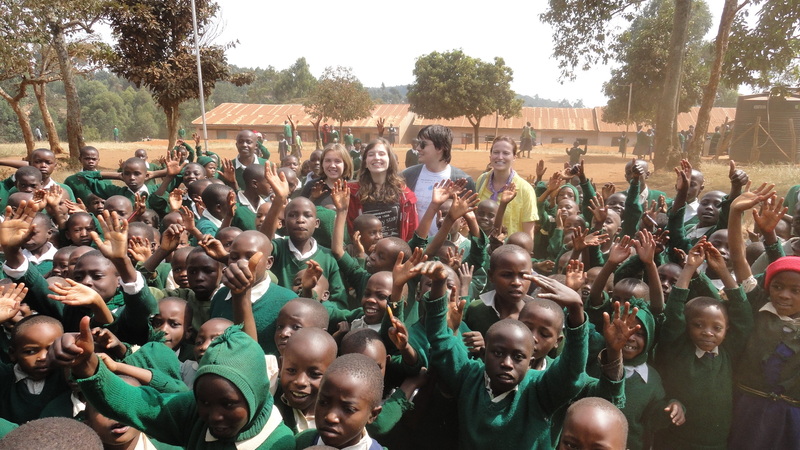 Quite often the top student in any grade is a child sponsored through this program. Other children, in high school programs have taken top honours in their schools. 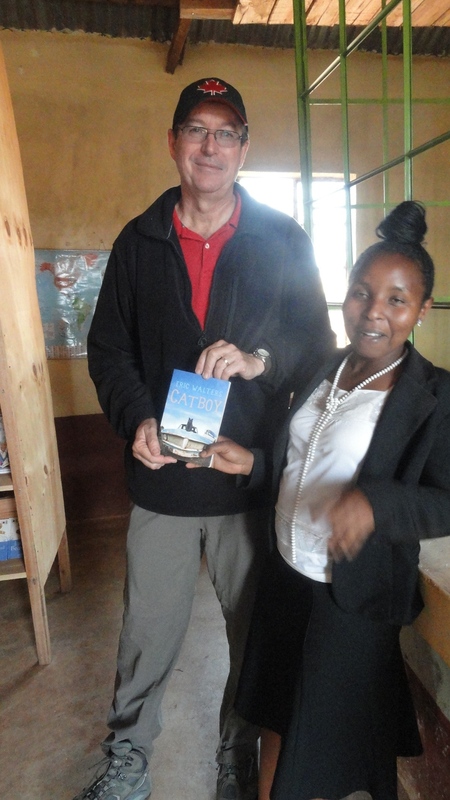 For example, Mary who attends a provincial high school, recently took an award for three separate subjects in which she was the top performer in her grade (I mention this with particular pride as she is the child sponsored by my wife and I). 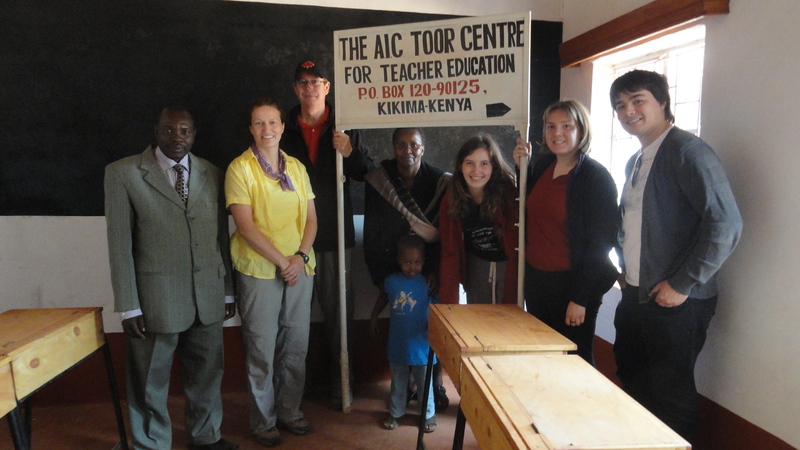 An education centre has been established in Kikima in a partnership between Ruth Kyatha and Rumeet Toor to educate teachers from the local community. The second session is now in progress and there are now 20 teaching candidates enrolled and taking classes. 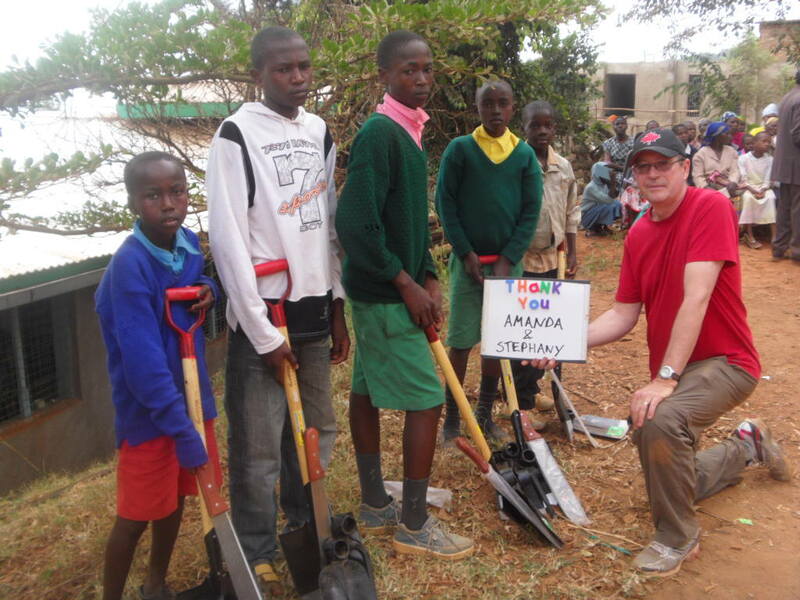 My first trip to Kenya was with my son Nick and we were there to help build a school to be dedicated in the memory of his Uncle Peter who died of cancer. 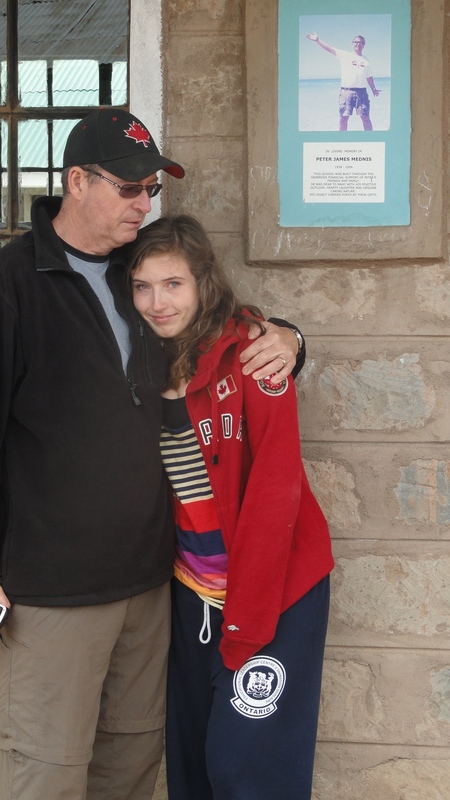 This last summer Peter’s daughter Emily accompanied me and we visited that school. This was an emotional event for Emily – and myself – and was part of completing the circle. Special thanks to Rudy and the school staff and students who welcomed us. Ruth is involved in a number of projects. She has been working with a group of ‘grandmothers’ from Nova Scotia to complete a new water project. I was asked to be a guest at the official opening of this project. The people were incredibly grateful for the work and funding that made this project possible. Now, especially at a time of drought, they are still able to grow crops and be self-sufficient. LaSalle P.S., just outside of Windsor, Ontario, has paid for the rent for Exodus Children’sHome for the past two years. This year they went even further – they raised $3200 – enough to pay the rent for the next TWO years! We attempted – unsuccessfully – to have a Skype session between the students of LaSalle and the orphans of Exodus. While the electronic connection failed the real connection is strong. They were also able to exchanged video clips on Youtube. Rolling Hills once again held their Hoops for Hope Basketball tournament. They raised an incredible $8537.77! Add to this a further $95.25 raised by Class 8 and $312.17 raised by other students for an incredible total of $9945.19! Our original building was named Rolling Hills Residence after the efforts of this amazing school. The new building, which will feature Diana’s Wing (the residence for the girls), and the Whitehorse Room (the dining/study hall funded by schools in Whitehorse, Yukon), will be carry on the Rolling Hills name and will be dedicated as such. Our students recently entered a financial Literacy Contest sponsored jointed by the Investor Education fund and The Toronto District School Board. The contest asked groups to submit a proposal which would raise funds for the charity of their choice. The prize was a cheque made out to the chosen charity. It is my pleasure to inform you that the winning group chose your organization. A cheque is included. The students would like the money to be used for school uniforms for children who would otherwise be unable to attend school. If this is not possible, please distribute the funds in the most effective way according to your observations. The students were inspired to support this charity because of a visit from Eric Walters to our school, Henry Kelsey Sr. P.S. this spring. They did more research, and then threw their entire support behind the charity. We are very happy to present you with this donation. Our good friend Sharon Freeman recently celebrated a milestone birthday. Her friends, as a present, made a donation of $455.00. Special thanks to Karen Danderfer for organizing this. 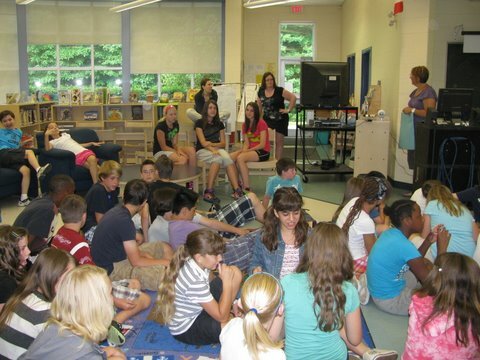 My grade 6/7 class was moved by your dedication and the need to help. They brought in pennies and loose change. Please sponsor the education of one of the children. One of our sponsors, Sue Van Norman has just retired as a teacher. She asked that in lieu of presents donations be made to Creation of Hope. $800.00 was raised! Joe and Sheelagh Desousa made an incredibly generous personal donation of $1000.00. Some of these funds were used to purchase school supplies for the Peter Mednis School while the remaining funds are for the Creation of Hope. Please find enclosed a cheque for $1247.50 from Jack Hulland School for the Creation of Hope. These funds were raised by my grade seven class by selling heart lollipops with a Have a Heart, Give a Heart campaign. They also participated in three litter cleanups throughout Whitehorse. I am extremely proud of these students for all the hard work they put in. They wanted to make a difference and see that others in our world benefited from their good fortune. They inspired others in our school to help and so some of these funds come from a Grade 1-2 class who raised just under $200 by way of popcorn sales. If possible, would you be able to send a letter to me or the school thanking the students (include the total raised) and explaining what was done with the funds so that we might announce it in an assembly or put it in our newsletter so that we might inspire more students next year to carry on supporting the Creation of Hope. Barb Kettle donated $100.00 to honor some people who repaired the roof on the shed in her backyard but refused to take money. She’s paying their service forward! Thank you for visiting Carrville Mills P.S. this year. We loved listening to you share your story as a writer, but even more, we appreciated you introducing us to your charity, Creation of Hope. It is a wonderful organization that clearly helps many people in the most direct way possible. This year our grade 8 students ran an Amazing race in downtown Toronto to celebrate their graduating year. Rather than handing out a trophy or a prize to a winning team, we all agreed that we would like to make a $100 donation to your charity, Creation of Hope, in their names and in the name of the school. Please decide where this money could be put to the best use. Thank you and we look forward to hearing about how our donation helps others through the Creation of Hope. Ms. Pina Santoro donated $280.00 for the Andrew Curling scholarship. We anticipate 15 of our children being in high school this year and estimate that the total cost will be approximately $5000 in total for their school year. You visited our school a few months back, and from your presentation we were inspired and spoke about raising money for your charity. In the school, we baked goods for after school events in order to raise money for Creation of Hope. We also participated in our multicultural event, Taste of Joan, where half the proceeds were forwarded to your charity. Overall we raised $944.09, which we are giving to Creation of Hope as a donation. The students are excited to know where their efforts have been directed within the organization. 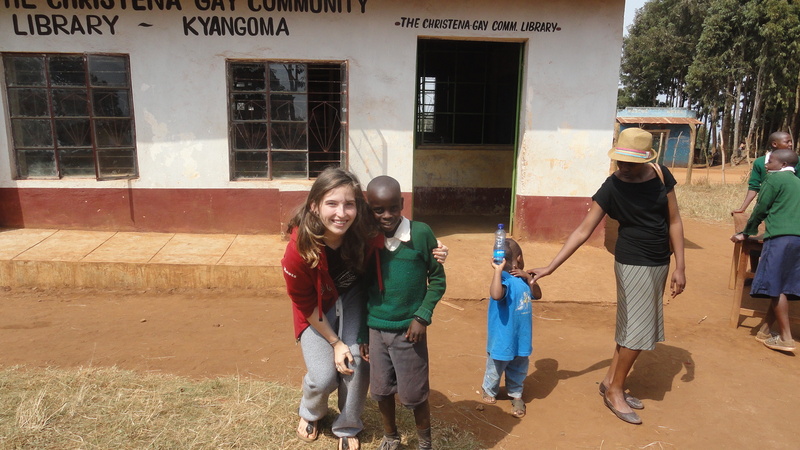 We are glad to make a difference in lives in Kenya and will continue to do so next year. One of our most dedicated volunteers, sponsors and fund raisers is Ryan Rumsby at Prince Philip P.S. St. Catherines – once again they have sent money to support Naomi over the summer. Glynn A. Green E.S. made a donation of $200.00 after I visited in the fall. Joseph Howe students who donated from change in their pockets; $36.00 was used to purchase 3 50 Kg bags of cement (@$10.00) and 33 bricks (@ .18 cents). 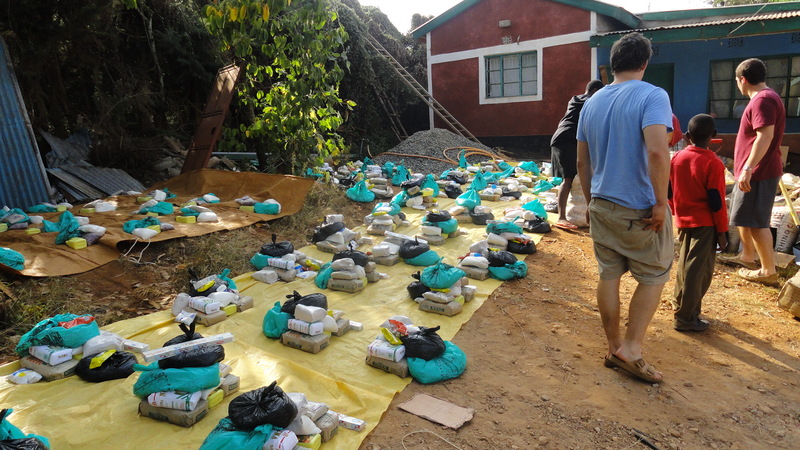 Alexander Graham Bell – $443.94 provided funds for 44 50 Kg bags of cement and 20 bricks. Prince Phillip school donated $614.34 which funded the purchase of 5 doors (@$57.00), 3 windows (frame, grill, glass, @ 93.00) and the remainder was used for direct purchases for Naomi that included school uniform and fees. Lisgar Senior Public donated $750.00 which was used to purchase 3 bunk beds for the new residence (@ $106), 20 bags of cement (@ $10.00) and 1288 bricks. Funds provided by Meaghan and Brendan Baginsky were used to purchase a bed for the residence ($106.00), a door ($47.00), a window ($93.00), subsidized the entire food distribution shortfall for June ($250.00) so no child would go with reduced food portions, 2 bags of cement (@$10.00) and 22 bricks. The donation by Sierra Lewis, a student at William Dunbar was used to purchase 556 bricks. Funds raised by White Oaks P.S. in Mississauga were used to pay for the Matron’s salary for the month of June ($110.00), to purchase a bed for the residence ($106.00), 10 bags of cement (@ $10.00) and 30 bricks. South Lincoln High School in Smithville donated $1600.00. This was used in the following way; construction labor costs (@$2.50 per day – 320 days of employment for $800.00), $300.00 for paints, 50 bags of cement (@$10.00). Funds raised by John M. James P.S. 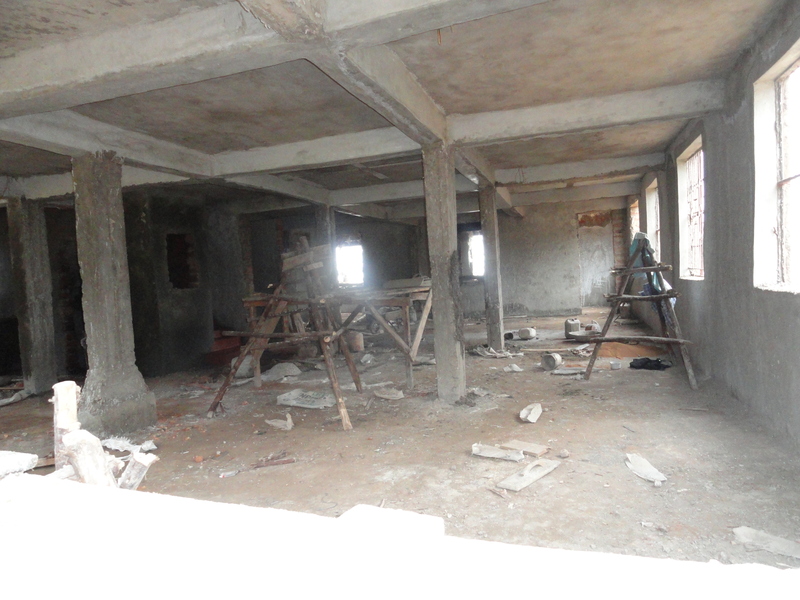 were used to provide wiring and lines for electricity and biogas plant ($500.00), 5 doors (@$57.00), 2 windows (@$93.00) and 249 bricks. The funds donated by Stride Avenue Community School were used to purchase 30 bags of cement (@$10.00). 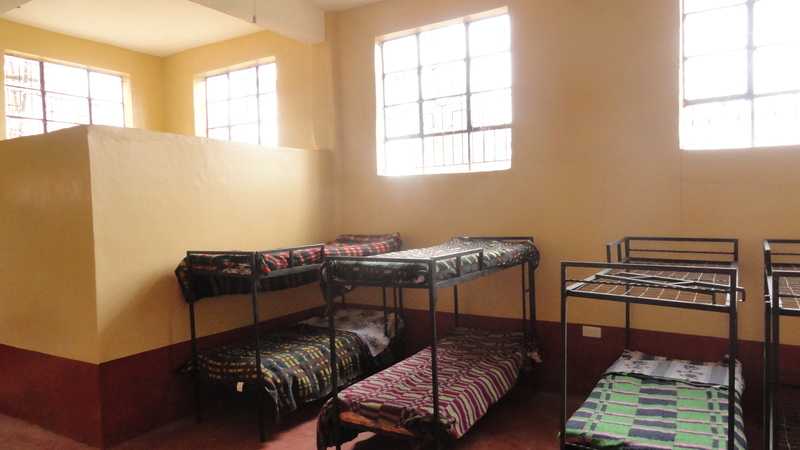 Funds donated by the De Sousa family were used to pay for the food distribution shortfall for the months of July and August ($620.00), paint ($100.00), a door ($57.00), a bunk bed ($106.00) and the remaining funds provided school supplies for Peter’s school. The money donated by Glynn A Green E.S. purchased 15 bags of cement (@$10.00) and 278 bricks. Funds donated by St. Francis Xavier H.S. purchased 622 bricks. Money donated for Sharon Freeman’s birthday party purchased 30 bags of cement (@$10.00) and 861 bricks. Funds donated by CodringtonP.S.is being placed in the Andrew Curling Si-We-Yah scholarship (along with existing funds from Pina Santoro ($280) and Bloorlea P.S. ($114.97) to fund high school tuition fees in the coming school year. The money donated by Carrville Mills was used to purchase 556 bricks. Funds from William Dunbar P.S. and Smart Start Learning were used to provide the cost of the tutor for 2 months (@$70.00), timber for construction ($220), two wish lists and 546 bricks. Donations from St. Joan of Arc C.H.S. paid for wiring and lines for electricity and biogas plant ($500.00), and labor costs (@2.50 per day – 177 days worth of labour). Funds donated by Jack Hulland Elementary School were directed specifically to the construction costs associated with creating the dining hall including two doors (@57.00), 8 windows (@93.00), electrical wiring $300.00, and paints ($89.50). The remaining funds from Christ the King were used to purchase 33 bags of cement (@10.00 per bag) and paint for the dining hall ($35.00). Funds raised through Sue’s retirement gathering were used to purchase and install electrical wiring and plumbing ($800.00). $300.00 donated by Henry Kelsey Senior P.S. 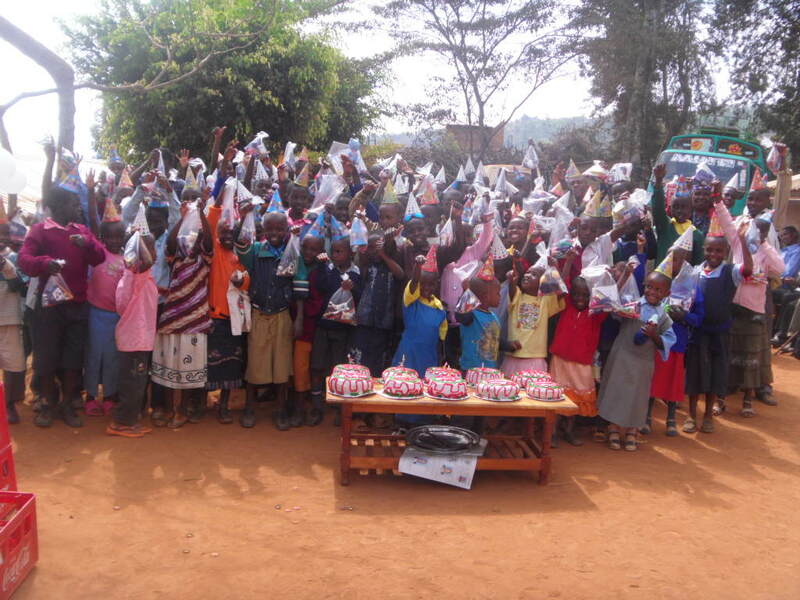 has been used to fund 25 school uniforms for orphans. As we hire local seamstresses the money has been spent but the uniforms are still being made. When they are made and given out to needy children we will put a picture on the website to show the specific children receiving their uniforms. Funds raised by Glenforest were used to provide a wish list for a child ($120.00), to purchase 150 bags of cement (@$10.00), the cost of the tutor for August ($70.00), the matron for August ($110.00), labor costs (@$2.50 per day – 200 days), paint ($400.00), 2233 bricks ($402.00), water for construction and ongoing care of orphans ($650.00), and 8 beds (@$106.00). 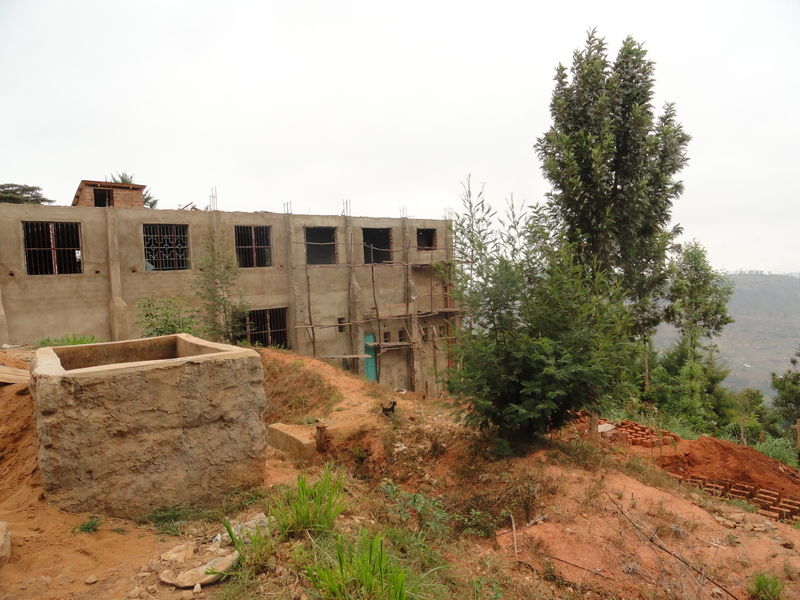 And last – but certainly not least – the funds raised by Rolling Hills were used in the following way; 248 50 kg bags of cement (@$10.00), 3049 bricks ($548.00), electrical wiring and plumbing supplies and installation $1025.00, labor costs (@$2.50 per day – 500 days) , $450.00 for water for construction and ongoing care of orphans, 6 doors (@$57.00), 10 windows (@$93.00), 10 beds (@$106.00) and $325 to cover the cost of the birthday party for the 97 children.